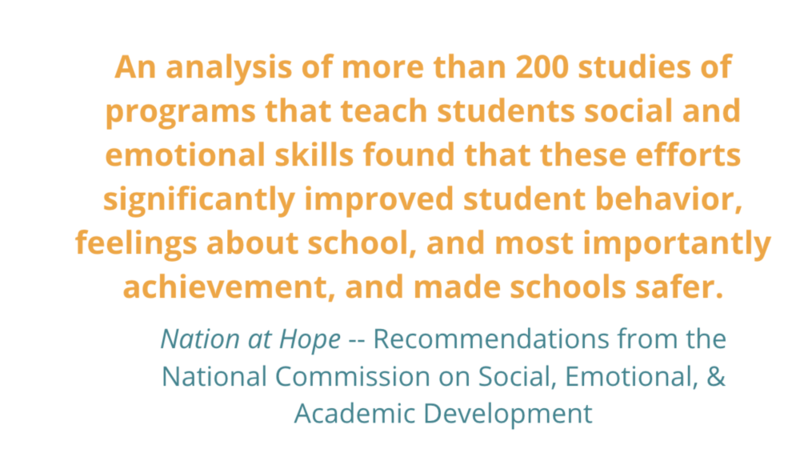 School and district-wide commitments to SEL programs positively impact students, teachers, and the community. teachers and parents believe that social and emotional learning is important to education. in terms of the average benefit-cost ratio according to a 2015 study by researchers at Columbia University. on average for students who participated in SEL programs versus those who did not according to a study conducted in collaboration with CASEL. Researchers, such as developmental psychologist Stephanie Jones and her team at the Harvard Graduate School of Education, find that social & emotional learning is most effective when the entire school implements the program. By partnering with ASSET, your school receives training and ongoing support to ensure a successful implementation no matter your school’s size. We offer multiple partnership opportunities to ensure the program fits the specific needs of your school. You can find more information about each partnership opportunity here. If you’d like more information about partnership opportunities, please contact Brent Modak at brent@asset-edu.org. Our team designed each of our partnership opportunities based on what we learned from working with schools and various organizations. In collaboration with organizations, including Teach For America Colorado and Denver Public Schools Imaginarium Innovation Lab, the ASSET Team developed a proven-to-work system to ensure an effective implementation at your school.